Traditional electricity meters only record the amount of power you are using, but not the times that it is being used. Advanced pricing takes advantage of newer ‘smart’ electricity meters that are being gradually installed throughout the country, including the Waipa Networks area. These new meters are capable of recording how much power is used at different times during the day. 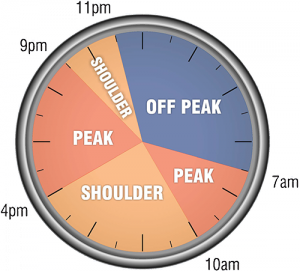 For Waipa Networks area, we group these times into three categories: Peak, Off Peak and Shoulder. There is a different price for each category. What happens to my power bill? We introduced this pricing on 1 April last year, but from 1 April 2017 we are making it compulsory for new connections and all Distributed Generation (for example, solar) connections. For those customers it doesn’t necessarily mean you will see this on your power bill – we will be charging your Electricity Retailer the new Advanced Pricing, but it is up to them if their price plans reflect this new type of lines pricing. Electricity Retailers often sell their electricity plans with other services such as telephone/internet, gas, etc and offer package deals. Over time though, we expect more of them to offer plans based on our Advanced Pricing. We plan to change all connections over to Advanced Pricing by 1 April 2019. Why Do Power Line Companies Care When Power Is Used? Peak electricity usage is a bit like peak traffic on a motorway. People tend to want to use the motorway the most at the same time – travelling to and from work. So the roads need to be made bigger and multi-laned to handle this, even though most of the time the road has much less traffic and in the middle of the night not much at all. Power lines are a similar situation - the more power people use at the same time, the bigger the power lines and equipment need to be able to handle this, even though there are times when hardly any power is used. Bigger power lines cost more money and ultimately it is the power customers that have to pay for these. So it is in everyone’s interest to try to reduce peak power usage. Our new Advanced Pricing is designed to help people understand the benefits of moving power usage out of peak times. - How do I get It? Talk to your Electricity Retailer first. Some Retailers offer Advanced Pricing plans but others don’t, or won’t for a little while until their billing systems are ready to do so. If you would like to see a list of Retailers that offer this type of plan, click here. Peak - this is when electricity usage is heavy. Everyone is cooking meals, turning on their heating (or air conditioning), watching TV, etc. People might also be putting on their dishwashers, clothes dryers, etc. Shoulder - this is when electricity usage is moderate. Businesses are open and most people are at work, or late evening when people start to go to bed. Off Peak - when most people are asleep and power usage is generally limited to shift-workers and appliances on standy-by.